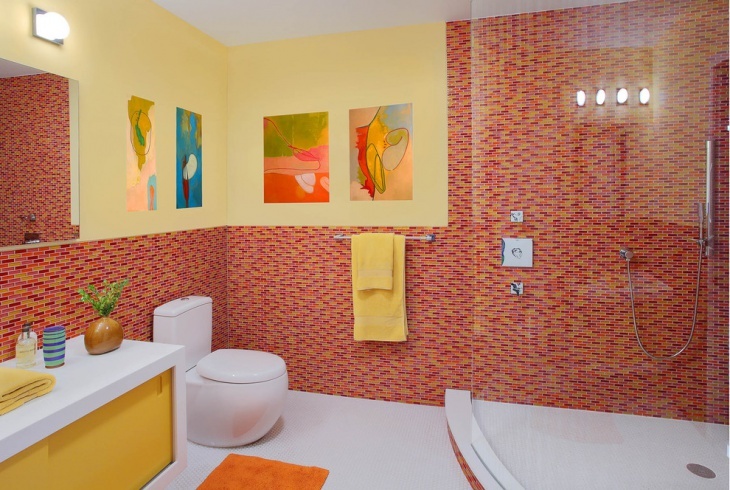 Having a colored theme to your bathroom can be a unique way to reflect your boldest interior tastes and choices. 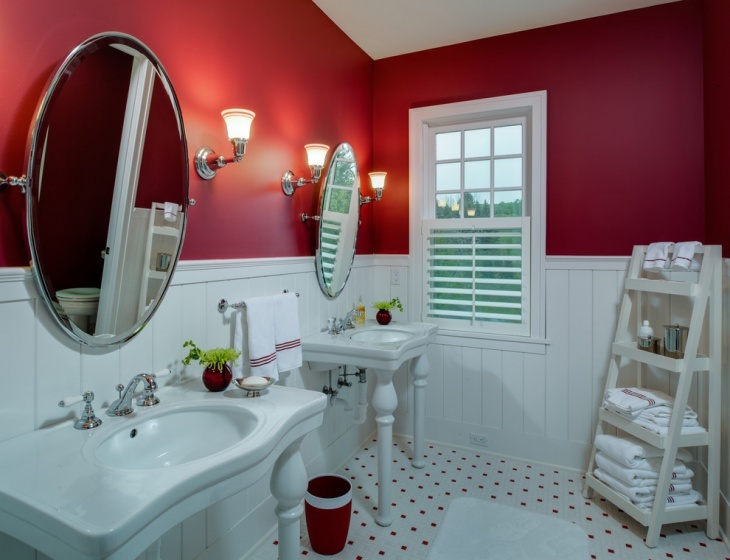 Including a red color theme to your bathroom might seem a bit tricky but with the right design inspiration, this bright color can actually liven up your bath space.We have compiled together a list of top 20 design ideas to include red in your bath decor. 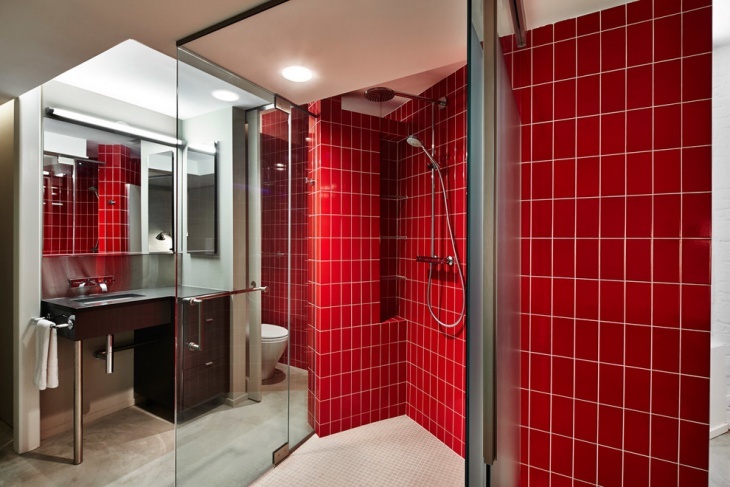 If you have a natural source of lighting in your bathroom along with a white bathtub, red can be an easy color to experiment with. 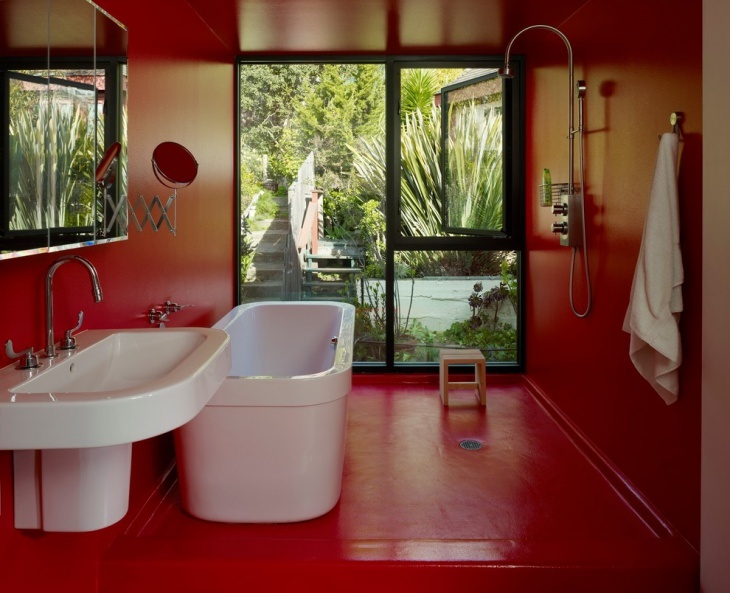 You can paint the floor and the walls red and let the basin, tub and towel add the contrasting element. 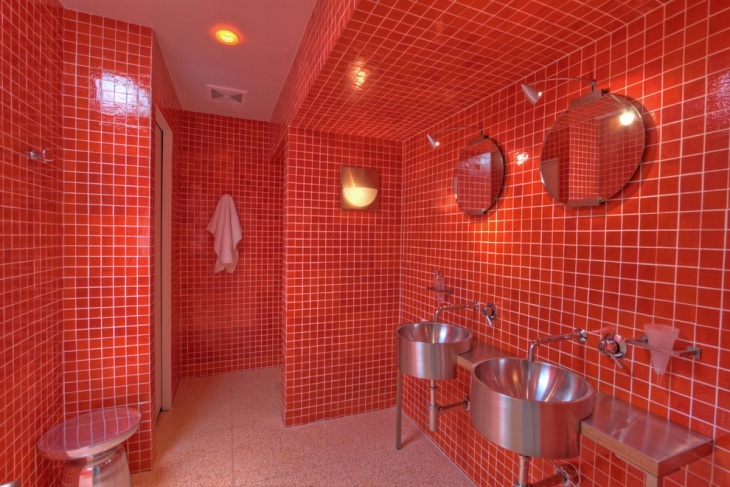 You can also include red with the help of tiles. The color red has a variation of tones and shades, choose the one that compliments the best to your floor and add it to your wall. The look supplements the vibrancy without being too strong for the eye. 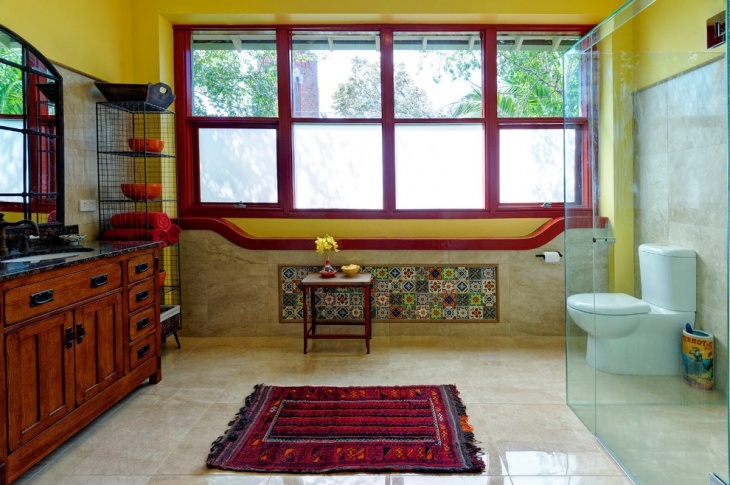 If you love the eclectic look, then you have plenty of options to test your hands with. 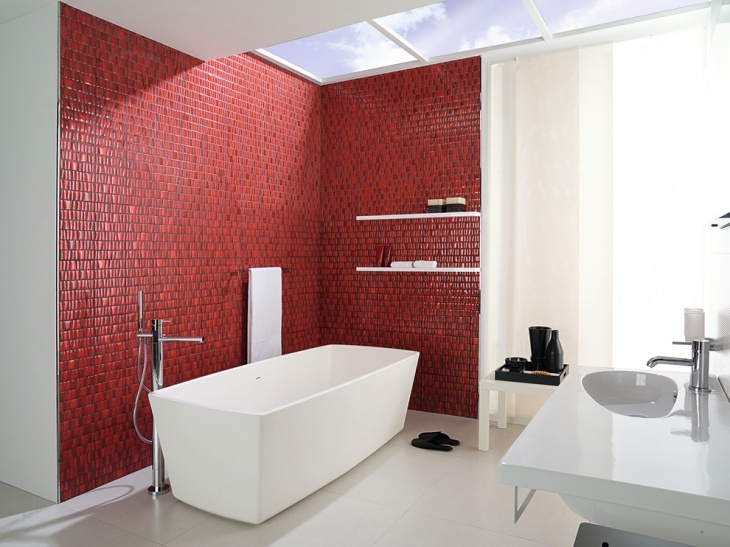 You can include a printed wallpaper with a red tone and also experiment with the red mosaic tiles. Mosaic has a class and can always help to add the subtle liveliness to your space. Try and contrast the bright look either with a white flooring or white cupboards. 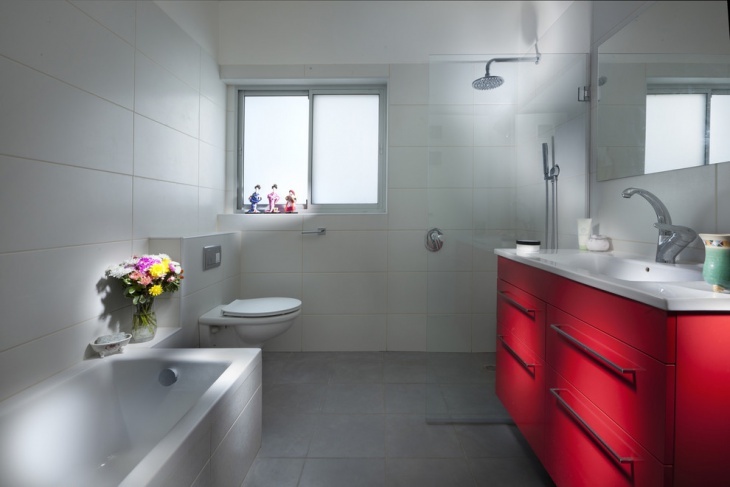 If adding bright tiles and flooring is not really your thing, you can still incorporate the color in your bathroom with red wood cabinets. 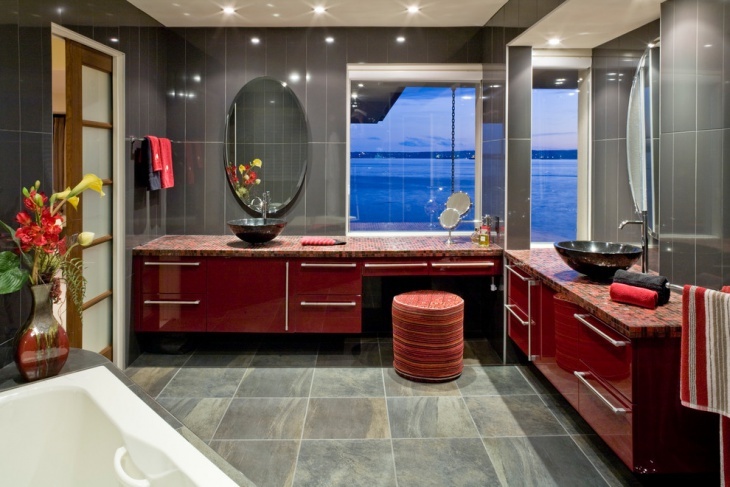 The red wood cabinets help to bring a touch of royalty and refined charm to your bath space. The look can be easily contrasted with black, white and gray tones. 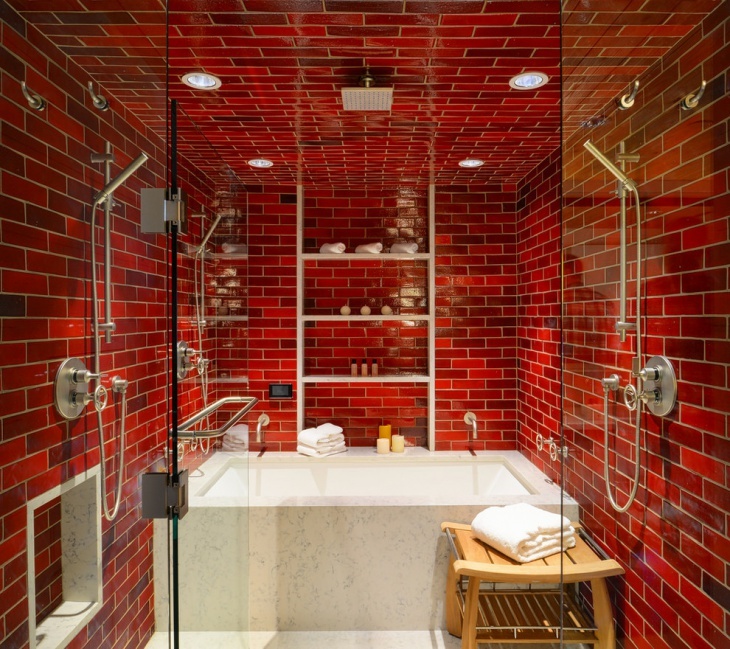 Including small red brick tiles can be another way to introduce the color in your bathroom. 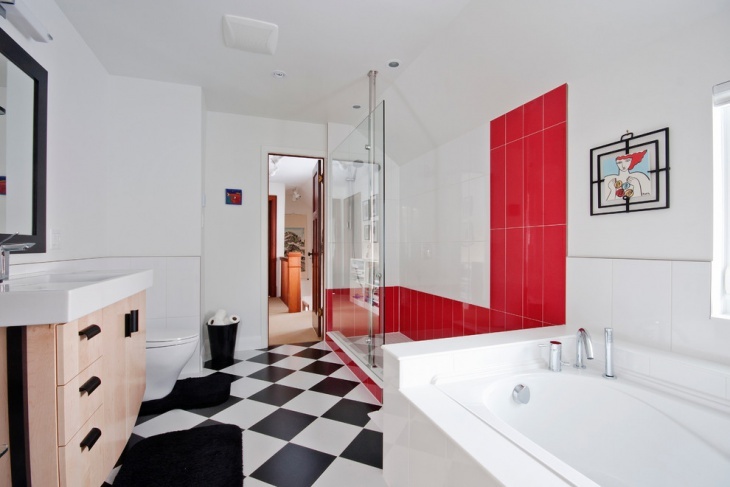 If you have a separate bath area adding the tiles to a small area transforms the look completely. 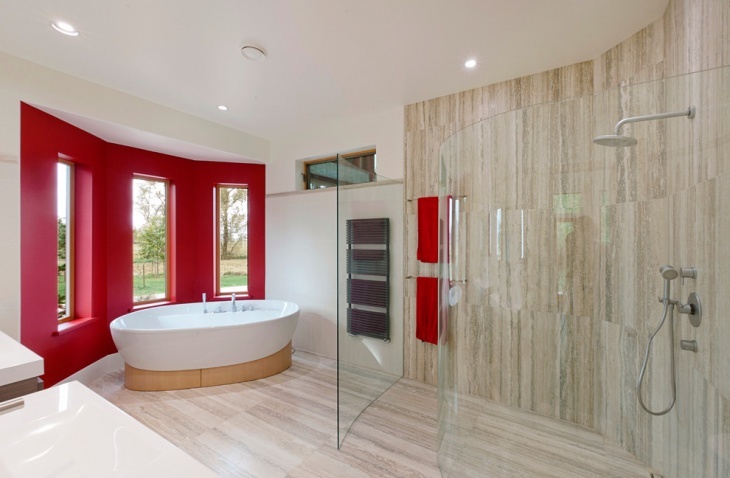 You can even include the tiles to one side of your bathroom for defining the space further. 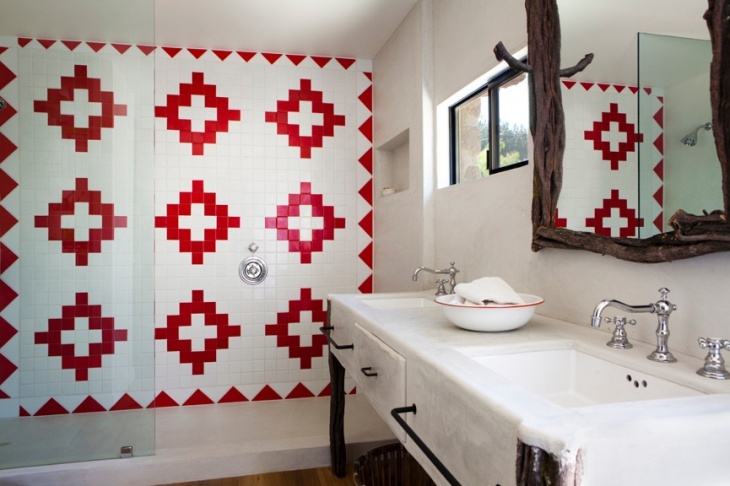 There is no need to stick to a standard pattern for including the red tiles in your bathroom. 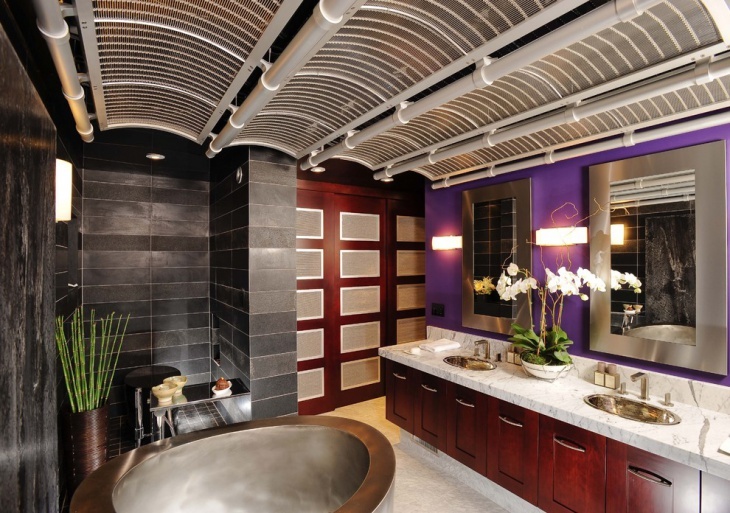 Be as experimental as you wish to, you can include the tiles in any shape and design of your choice. 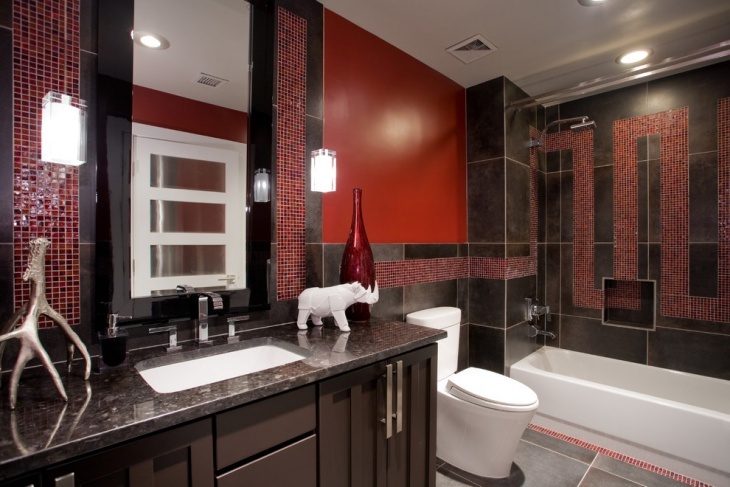 If you wish to add a contrasting color of tile to bring in some fun and balance to your bathroom. 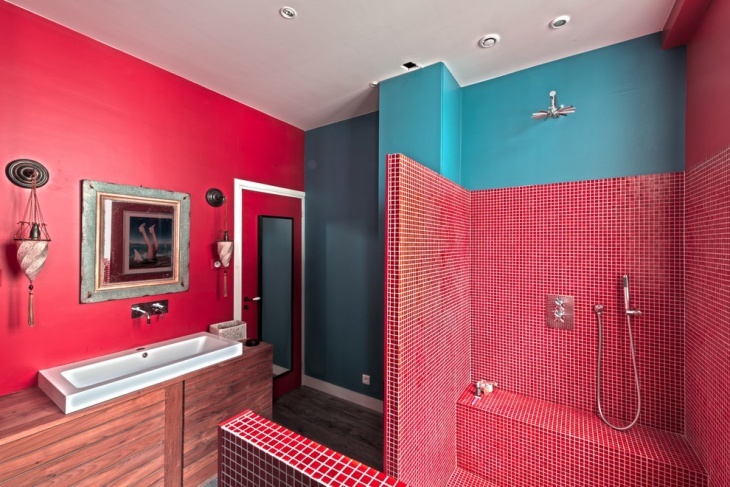 If solid red turns out too bright for your bath space, try and include red in prints. 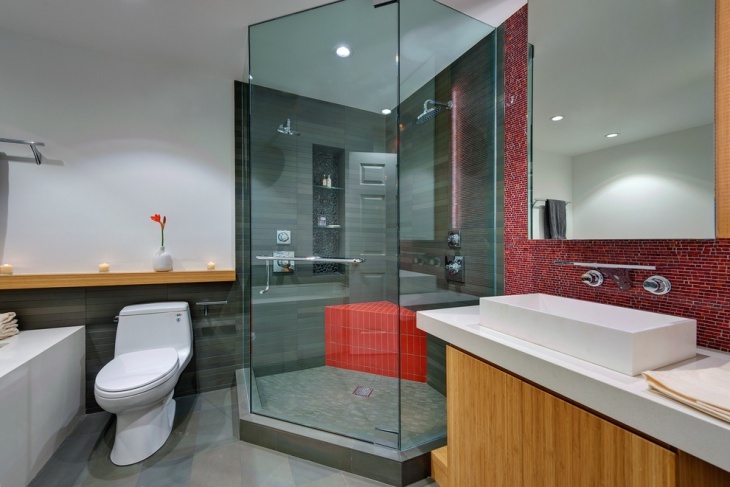 You have plenty of choices in tiles or stones for narrowing to a perfect customized fit. If you have an entire white bathroom space, this simple trick would transform the look completely. Just change the color of your cabinets or drawers to red and you yourself will see the warmth and color it brings instantly. You can even include some natural flowers for bringing a variety of hues to your bathroom. 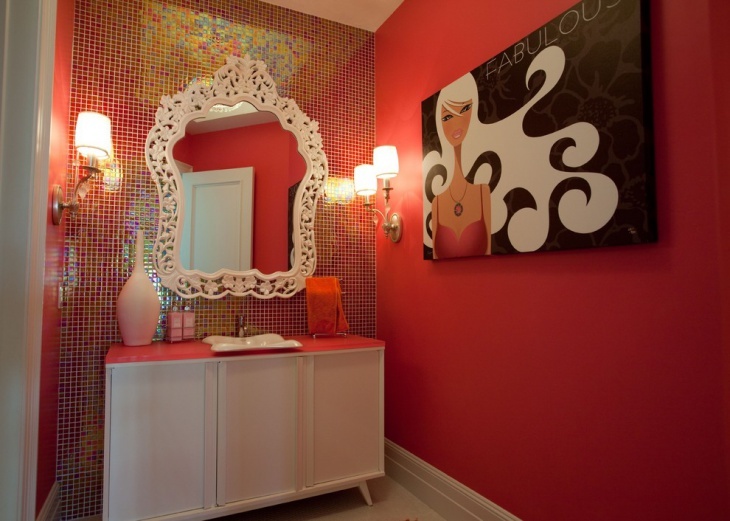 If red in the form of paint or floorings is too much a hassle, you can try and include some bright artwork to your bathrooms. The look will be unique and an easy and bright fix to a dull or boring space. 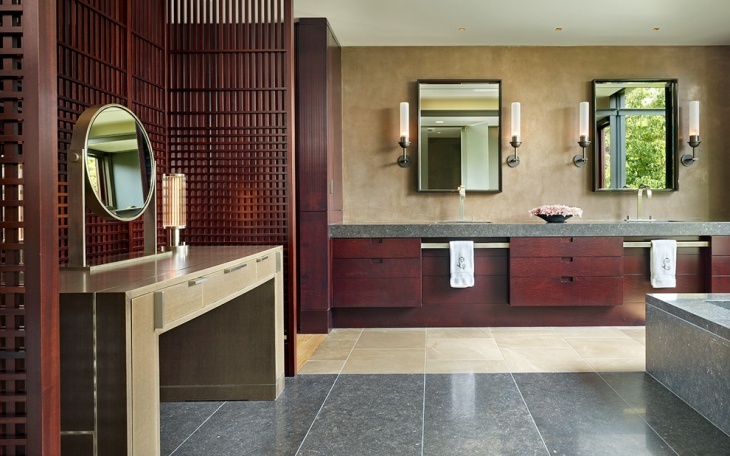 A subtle redwood cabinet is another way to try and include the color in your bathroom. The look is basic and very soft for people who love neutrals. 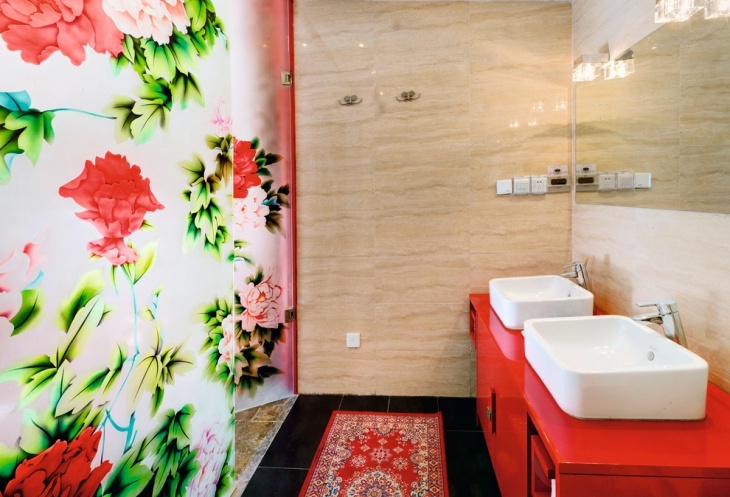 If you love the color red but are hesitant to try and experiment with it in your living space, exploring the color and its various prints and patterns in your bathroom would be a very handy idea.Testing the look in the bathroom will be safe and might just help you bring some energy to your bathing space. You can easily modify and customize the look as per your taste and preferences.